Remember the Amazon retail store that was absolutely positively opening in Spring 2012? At the San Francisco popup store, Kindle Paperwhite e-readers were displayed on shelves beside well-worn hardcover books like a volume of Lord Byron’s poetry and Charles Dickens’ “The Pickwick Papers.” Two women staffed the site in Kindle-branded denim shirts. Both locations are temporary and it's not completely clear whether they're staffed by anyone from Amazon. While Amazon has been hiring Kindle field reps since June of this year, those reps would likely be more willing to talk than the one employee cornered by the WSJ reporter. She did not give her name, and she said she was not an Amazon employee. So, do you think this means Amazon might actually be interested in a retail store? Update: Amazon says that these aren't retail stores. The rumors of the past couple years were pretty conclusively disproved last Fall when Jeff Bezos denied any interest in opening Kindle-branded retail stores, but he did also say that Amazon didn't see how they could run a store that was better than existing retailers. 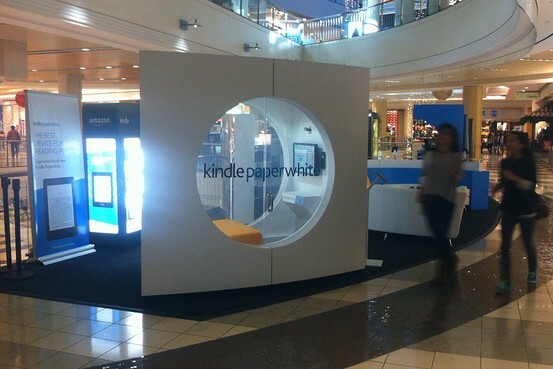 Maybe these pop up stores are a sign that Amazon is testing a new idea for retail. I don't think so, but times change. If nothing else, who would have guessed that Amazon would put their logo on a chain of retail kiosks in Brazil? Those kiosks sold Kindle gear, but were operated by the Brazilian cellphone retailer Superfone, which at one point had 9 Kindle kiosks. Perhaps Amazon is testing a similar idea for the US. Many are probably going to point out that Amazon is short of retail partners now that Target, Walmart, and other major retailers have stopped carrying the Kindle, and even the one or 2 indie retailers that Amazon manages to pick up under the Amazon Source program won't be enough to fill the gap. While that is true, I am not convinced that Amazon's own chain of retail stores can solve the problem either; there's no way Amazon could open enough locations to match Walmart or Target. And it's not like the Kindle hardware has the profit margins of Apple gadgetry, so any retail location run by Amazon just to sell Kindles would probably be a money-losing operation. With that in mind I am going to stick with my current disbelief. There just isn't enough evidence to convince me to change my mind. Is the Internet a Greater Threat to Publishers than Self-Pub eBooks? Amazon might simply be running a test to see the kind of behavior consumers exhibit: do they browse, sample and buy, or just walk on by? And if they buy, what kind of buyers are they? Newcomers to the ecosystem or existing customers? Amazon is all about the data. I agree it could just be a way of testing to get customers reactions to the devices. The “shop” looks a lot like the set of their TV commercials, in fact. How would this affect Amazon’s tax position? As I understand it, they dodge a ton of tax by being online only. Urban legends aside, Amazon already has a deal with California to *collect* sales tax on California residents. Their lack of presence in other states means they don’t have to act as unpaid government employees (tax collector) but has no effect on the taxes they themselves owe. Which they pay to whatever level the Swiss cheese laws require. Not being run by idiots, that means paying *only* what the law requires. And not one cent more. Thanks. That makes sense. Amazon has worked hard to avoid paying taxes and I didn’t expect them to do anything that might jeopardize that.